Milton Adams (William Ainscough) is a 12 year-old boy growing up in an economically and socially unpredictable world. His mother (Mia Kirshner) and father (David Sutcliffe) are workaholics with marital and financial problems, and he is bullied at school. 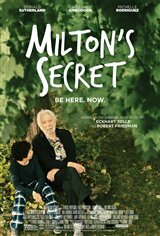 However, when his grandfather (Donald Sutherland) visits, Milton learns an important truth from him. Going over things from the past and worrying about the future stand in the way of him finding true happiness in the here and now.